Project: Eventuelt.org – a new guide to Århus _ Mathias Vestergaard Corp. If you live in New York City, you know that there is always something going on somewhere and if you know the right people you will know where to go. However, in a small town like Århus, there is not that much to do and when there is finally is something new and exciting going on, you sometimes risk to miss out on it. I discussed this problem with Andreas Lemche, who wanted to develop a blog to alleviate this problem. He felt he was pretty well connected and he wanted to share the information he had. We quickly realized that it might be better to go for a collective approach. Andreas thus started recruiting people and I worked on a simple design template for the site. 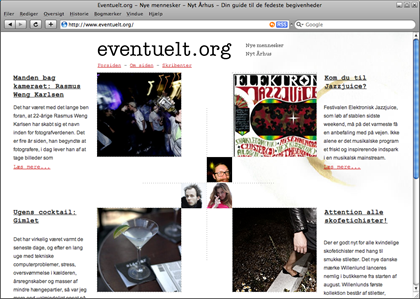 Eventuelt.org answers one basic question: What can I do in Århus within the next week? The design is simple. Inspired by an idea of the 1920s New York Times newsdesk, with coffee, cigarettes and deadlines, the site incorporates typewriter-style fonts, narrow newspaper text columns and a visual marker showing spilled coffee on a piece of paper. The front page shows the four latest entries in a grid layout, providing a very clear overview. In addition to project coaching and technical assistance I also contributed to the blog with a weekly column on cocktails. Today I’m featured on the blog as a special guest – blogging about my life in general.